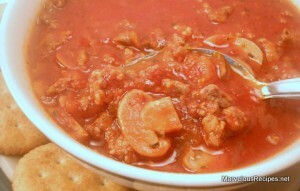 A delicious tomato soup made extra hearty by adding ground beef and bulk pork sausage! Simple, easy and very appetite satisfying! In a large saucepan or Dutch oven, cook the ground beef, sausage and chopped onion until the meat is no longer pink; drain and return to the saucepan. In a large bowl, combine the pizza sauce, tomato paste and water until smooth. Stir in the mushrooms, Italian seasoning, salt and pepper. Add the pizza sauce mixture to the meat mixture; stir to blend. Cook, covered, over medium-high heat for 15 to 20 minutes stirring occasionally. Makes 8 servings. * Bulk Italian sausage may be used in place of the pork sausage, if desired. This sounds yummy, Emily!! We add a Soup Night to our menu plan in the fall and winter. This will surely be one we try! My kids like anything with pizza sauce! !